The Hong Kong Holiday Package invites you to visit a modern, sophisticated island city with a stunning skyline. It is also known as ‘fragrant harbour’ because of the incense drifting with the sea breeze near its shores in days of yore. Today it’s a ‘happening’ place, standing up with pride in the forefront of the world, leaving the visitors enamoured by its glory! Hong Kong has innumerable hilly regions, rivers, beaches, and bays. The Hong Kong Holiday Package will guide you to a trip across Victoria Harbour, leaving you mesmerised, as shimmering water, blue sky, scenic land, and the surrounding mountains merge to render an amazing view. A ferry service, ‘Symphony of Lights’, takes tourists around the island at night, when it glitters like jewel drops in the sea. Quaint kai-to ferries and junks can take you to remote areas. Its Peak Tram speeds tourists along with spectacular sight-seeing on its way to Victoria Peak. 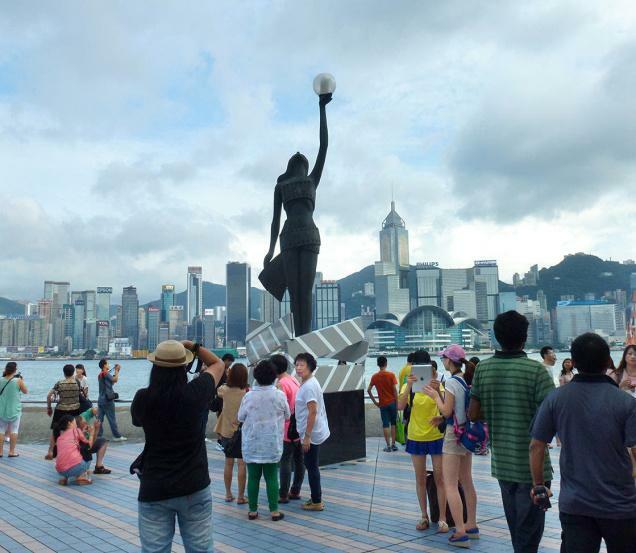 The Avenue of Stars offers fantastic views of the Peak and the stunning skyline, with the names of movie icons and movie memorabilia, including a life-size statue of Bruce Lee, lining the street! The Ocean Park with a giant panda, thrilling rides and a superb aquarium, is a must-see for tourists. During your Hong Kong Holiday Package, you will be seeing some exquisite monuments. The giant bronze Buddha, Ngong Ping piazza, Po Lin monastery and sedimentary rock regions are keen tourist attractions. You can even watch playful dolphins in the deep blue sparkling waters! The Hong Kong Disneyland promises a pleasurable outing in any one of its Theme Parks, enthralling both adults and children – a pure family affair to remember! There are plenty of drama, music and dance events happening every month. The city has an enticing night life, bars, pubs, cafes, dance companies, boat races, and horse races to keep you on your toes and rush the adrenaline in your blood, enthusing you to experience the luxury of spas to rejuvenate yourself. Your Hong Kong Holiday Package will lead you to its lavish boutiques and malls, with the trendiest haute couture that would surely tempt you to splurge, besides there are many shopping areas from where you can buy some special mementos. Hong Kong is enlivened with many street markets, including a night market and a special ladies market, adding a sparkle to their eyes! Popularly sought after are its jade and ivory curios, Chinese black and herbal tea, and, of course, gold jewellery, which is priced low and tax-free. Regarded as Asia’s ‘culinary capital’ with over 11,000 restaurants serving Cantonese and Chinese cuisine, besides authentic Western and Asian dishes. There are defined food districts as well. The city has the most innovative gourmet, fast food restaurants, and is popular for its tempting dishes of dim sum, fresh seafood and hotpot. Though it has a humid, sub-tropical climate, Hong Kong is worthy of a visit throughout the year! Exuberance galore!